The Oakland City Council voted to renew its status as a “city of refuge” on Tuesday night, and called on Gov. Jerry Brown to make California a sanctuary state. About 100 people held a candlelight rally outside City Hall. Dozens lined up to speak at the meeting in support of the resolution. Assemblyman Rob Bonta promised to continue fighting in Sacramento for laws that protect immigrants who follow the rules, like the state law that provides licenses for undocumented drivers. “As Oakland and the East Bay goes, so goes California,” Bonta said. School board member Rosie Torres said her heart was aching for the many students in the Oakland Unified School District who recently immigrated to the city to escape intolerable conditions. “And this is how we greet them? This is not who we are,” she said, referring to President-elect Donald Trump's promise to pull federal funds from sanctuary cities. Torres said the school board would consider voting on making the district’s schools into sanctuary schools. If the Trump administration follows through on its threat to pull federal funding from cities that don't cooperate with federal immigration authorities, Oakland stands to lose $140 million that goes to preschools, homeless shelters, and meals for seniors. 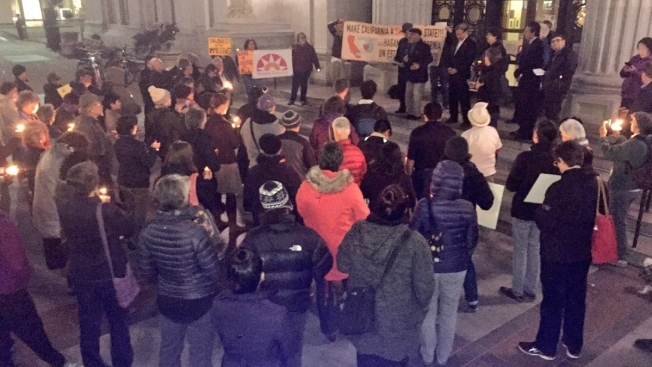 Oakland has been a sanctuary city since 1986, when it declared itself to be a refuge for immigrants from conflicts in Guatemala, El Salvador, Haiti and South Africa. The city reaffirmed its status in 2007. Former mayor Jean Quan remembered how law enforcement asked her to renew its sanctuary policy then, so they could conduct outreach and better protect immigrant communities. "That resolution made the whole city safer. This time, it's a broader issue -- not just safety, but democracy itself that we're defending," she said. San Francisco’s sanctuary policies came under scrutiny last year when an undocumented immigrant was charged with murdering Kate Steinle. Francisco Lopez-Sanchez was released roon a marijuana charge despite a request to turn him over to Immigration and Customs Enforcement, or ICE. In 2013, California passed the Trust Act, which allows jails to limit compliance with ICE.